From Bags to B*tches: Chic Recycled-Bag Boots! Plastic bags are a ubiquitous part of our consumer culture. Several countries and cities have banned the use of plastic bags. Some companies, like Ikea, offer only reusable bags at the counter. As a culture, we are moving toward plastic bag reduction. But what about all those bags that are already in the world? Can they be repurposed, rather than tossed? Yes they can, thanks to Chilean designer Camila Labra. 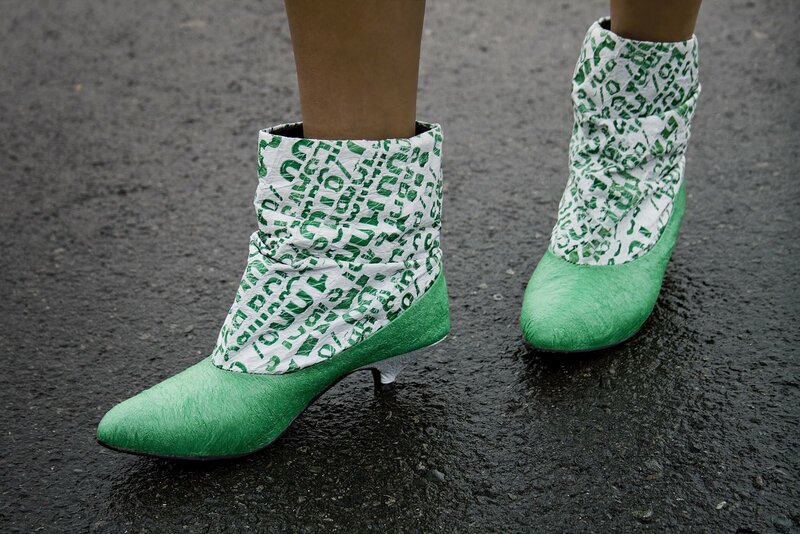 Labra refashions plastic bags into chic Dacca boots. Using a special process to fuse layers of polyethylene bags, Labra creates a waterproof, durable outer layer. The inside of the boot is layered in soft cotton. I love how the plastic bags automatically create interesting patterns. These boots are beautiful enough to be featured on any catwalk (and far more stable than recent skyscraper heels). Unfortunately, they’re not yet being produced in the United States, so you’ll have to order them for $45 through Miss Labra’s blog. Attention shoe companies seeking huge profits: these boots will boost your eco-rep and your bottom line. PLEASE help bring them into the American market! This entry was posted on Tuesday, January 13th, 2009 at 8:00 am	and is filed under designer shoes, Eco-Friendly Shoes, Fashion Trends, Main. You can follow any responses to this entry through the RSS 2.0 feed. You can leave a response, or trackback from your own site.